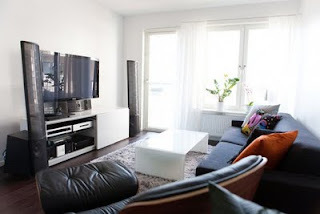 How do you like to decorate your drawing room with-a T.V. showing news or a T.V. showing a daily soap. I think that we all should care about this antique piece of decoration in our drawing rooms and in our lives rather than some exquisite and elegant show piece. Today, we all are engaged in our strenuous daily lives, that nobody has more than one or two hours to watch T.V. The important thing is what you choose to watch in that short span of time, after you come from your offices and meetings. - A cultural channel showing some laughing pot cracking a joke, for example : A man came out fro m his car, running like a mad, reached a pizza shop in a hurry, when it was raining heavily, and asked to give him a pizza. In return. shop owner asked him whether he was married or not. He answered - Do you think my mother will send me at this time to bring for her a pizza. Now, it has to be your choice, what you should watch. It is not that we should not watch news channels at all, but we should be careful, what all is being shown on T.V, and if that makes any sense to us or not. There are around 10 to 15 twenty-four hour news channel, showing one and the same thing all time for no reason, and also there are almost same number of cultural channels presenting reality shows and daily soaps of all types. It is not that cultural channels show everything genuine and correct all the time; that is not possible, and one should not hope for the same. Instead, one has to be conscious of what channels are showing, as it is scientifically proven that what one watches forms an image in a mind, that can lead to change in thoughts, thus eventually changing one's course of actions. One can look at the above fact under the light of a daily soap, in which two ladies or two bahus (more appropriate), are fighting for their position and rank in their very own home, then that also has a same effect on mind of people watching it, and suppose that you are one of the bahu in your own home, then what impact could it make on your thoughts. It is not a spontaneous process but a gradual one, that moves like tortoise , but once the race is finished can explode like a thunder storm in your lives. As you watch something repeatedly of same kind, it forms an image in your mind and that governs you to take actions accordingly, and in my opinion news channels and soaps showing fights and irrelevant matters can effect your lives more than anything. Not a single day is there, that we do not come across a news of death, robbery, molestation, kidnapping and all the other dreadful crimes. The life of the one who suffered the incident gets destroyed, and news channels showing them repeatedly destroy lives of common people. It is a mystery to me, what one gains by watching all those slayings and killings, that is not for a penny, concerned to the common people. Now with the changing times, T.V. has also reserved its place in our bed rooms, and suppose one comes across a news as of my first example of Raj being murdered and .....You can imagine that, it can destroy your night's sleep, and can also effect your mornings, and once morning is not good, then what to talk of the forth coming day. I think it would be better, if we spend sometime laughing and listening to songs, as that can attract happiness and good things in our lives. In fact, we all are aware that it is written in our religion books, that one should indulge in activities like bhajan and kirtan ( songs praying to God). I think that those songs, have been replaced by songs that we hear today, probably for the youth, and that can have the same impact as those songs if sung in group, as it is not God mattered in the songs, but the energy that is created by so many people singing one thing together; and I think it can be anything, if it is good and sensible. Lastly, it is we who can change our lives and can attract immense happiness in our lives, by simply sitting and watching T.V. in our drawing rooms. Hey pal. I am happy to be your first follower. I read your blog and you have pretty interesting unique ideas. may I suggest you to write a little short with short paragraphs so that people will not go away halfway through. happy blogging. Its a interesting topic you have taken and did a complete justice to what you have taken! Keep Blogging and Keep Smiling! I am happy that you liked the topic and ofcourse the write up. Keep coming here, keep commenting and keep smiling! A nice take on the subject chetan.. however, i find it a bit biased. You have rightly questiond the scum of TV but failed 2 mention any cream... TV is not tht bad, i believe!